There is a huge gap between a prototype and a market-ready product. Beside the many engineering issues, funding can be a breaking point for any project. getitmade.com sets out to help solve that problem by creating a pledge bank for future products that utilises social networks to build a critical mass of pre-orders, which allows the product to be sent into production. GMT: Who is involved in getitmade? Nick Ager: getitmade was founded by Rob Dobson and Nick Ager – we are two entrepreneurs who became frustrated by the difficulty of taking our prototypes into production. Having both successfully founded previous companies we became convinced that there must be a simpler way of getting new product to market. How did getitmade come about? We both harbour a love for creating physical products and found that our experience building software companies could be channeled to help. We were discussing our product ideas and how best to find out if there was a market for them when we came up with the the idea for getitmade. It’s the website we wanted to exist for our own product ideas. We hope other product innovators will find the platform equally useful. What problem does getitmade solve? Market-testing and funding from prototype to production. Many great ideas stumble at this stage, though a good example of one that broke through is the ubiquitous Brompton folding bicycle. The inventor Andrew Richie was turned away by existing bicycle manufacturers who said there was no market for his folding bicycle. The banks were no more help and refused to provide funding. Richie overcame these obstacles by pre-selling bicycles to his friends and family. getitmade uses the same pre-selling model but harnesses the reach of online social networks such as Facebook and Twitter to help lots of other innovators fund taking their products from prototype into production. No money changes hands unless the product pre-sales reach production level and it goes into manufacturing. Have you any experience of the UK VC world? What is your experience of the UK VC World? Rob sold one of his previous businesses to a Private Equity company and is an angel investor in a number of other companies. getitmade is currently self-funded but we keep an open mind about funding alternatives in the future. What was your initial itch that made you think getitmade would be useful to you? Over a beer we discussed a number of great new product ideas (ok that’s intended to be a bit tongue in cheek!). Nick was keen to solve a problem he’d encountered while sailing the oceans in the previous few years – an errant auto-helm that often got him off track and sometimes into trouble. Rob’s big idea (aside from the dart that automatically finds double-top – or the bowling ball that automatically gets a strike every time) is a projection bedside clock that is really a computer and allows you to watch youtube and read books on the ceiling. For that one go to getitmade.com – Rob’s looking for help getting the idea into production but there is a really cool 3D design for how it could look! 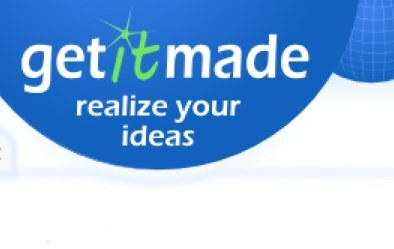 Is getitmade just for inventors? It’s for anyone who has a product idea and wants to test the market and raise the funding to realise their ideas. It is also for people who already have products in production and would like to aggregate demand and move towards batch production – to simplify their supply chain and reduce the reliance on stock. Do you help find manufacturers? Yes, we aim to help innovators find manufacturers that will be appropriate for the quantity of their product they plan to manufacturer. What’s the difference between getitmade and eg kickstarter.com? getitmade is focused on products and actual pre-sales of those products. Conversely kickstarter (for instance) uses a donation approach to fund projects that may result in something being produced. The key difference is that we aim to protect customers interests rather than relying purely on trust. Have you found a UK/European bias to your sign-ups? We are UK-based and, almost inevitably, have started to focus on the UK and Europe. Having said that we’re convinced there is opportunity worldwide and the site can be used by innovators from anywhere and already caters for multiple currencies & shipment destinations. Will you be at Maker Faire this year? Yes we’re very excited and hoping to be exhibiting at Maker Faire up in Newcastle 12-13 March. We look forward to meeting the maker community and promoting the products already on getitmade. What is your competition about? Our competition is to encourage the first few innovators to upload their products onto the site. There’s nothing to lose by putting product ideas onto the site and we hope to overcome any initial hesitancy by offering a few prizes. There’s a range of cash prizes and a MacBook Air to be won.